The Federal government’s fiscal year comes to an end on September 30, and for the sixth straight time, lawmakers will need more time to figure out how they will pay the bills for next year. This is the ninth time in 11 years that Congress has looked to a temporary spending measure, called a Continuing Resolution (CR), to delay decisions on the nation’s funding priorities, 56 times in all since 2001. Last year’s budget debate required seven CRs and took until April to resolve. In August, House and Senate leaders agreed to a longer term approach, announcing that Congress would move forward with a six month package, pushing-off the decision on specific funding levels until after elections are over and a new Congress is sworn-in. While the CR will allow the federal government to continue spending money into the new fiscal year, it also puts limitations on how that money can be spent, and those limits are especially acute for the Defense Department (DoD). DoD has enjoyed more than a decade of increasing budget top-lines and used those funds to address the changing needs of a force at war, but lawmakers were poised to cut defense spending next year for the first time since the terrorist attacks of Sept. 11, 2001. Instead, the CR, approved last week by the House and set for a vote this week in the Senate, will boost the base budget by more than a half-percent to $519 billion. Overseas Contingency Operations (OCO) would be funded at proposed fiscal year 2013 levels, a reduction of $26.5 billion. As with any spending measure, there are winners and losers with the CR. Though Congress will provide DoD with more money than previously expected, the Department will lose some of its flexibility in spending it. The Navy is hit particularly hard by funding restrictions and policy caveats that could impact current operations, future readiness and long-term planning priorities. At the top of the priority list for the sea service is the aircraft carrier USS Theodore Roosevelt (CVN-71). 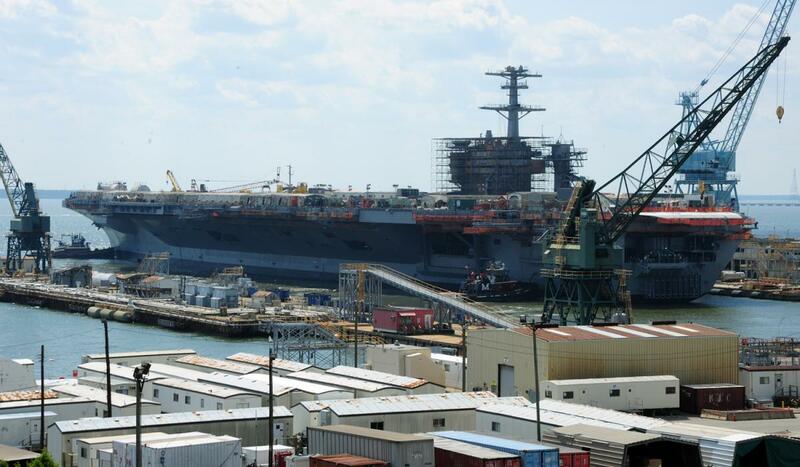 The 26-year old ship is in the final stages of a three-year-long maintenance and modernization period in Newport News, Virginia that the Navy calls a Refueling and Complex Overhaul (RCOH). By the time the TR sets back to sea in 2013, the ship will have new nuclear fuel in its two reactors, upgraded combat and communication systems throughout, and repairs will be made to the ship’s hull, mechanical and electrical systems to keep her viable until at least 2036. The process costs nearly $2.5 billion, but funding for the current phase will dry-up in less than 5 months unless Congress approves new spending for the work. So far, though, this year’s CR does not include funding to finish the overhaul. RCOH funding shortfalls are nothing new for the Navy. The 2005 CR did not include funding for similar work on the USS Carl Vinson (CVN-70). That year, members of the North Carolina and Virginia delegations lobbied appropriators to provide money for continued work on CVN-70, and stand-alone legislation approved late that year allowed the RCOH to proceed. The Navy also cannot prepare for the next carrier in the Nimitz-class to begin its overhaul, currently scheduled to begin in 2013. Language included in the CR would prevent the Navy from procuring so-called long-lead items needed to begin the RCOH process on the USS Abraham Lincoln (CVN-72) because new initiatives are specifically prohibited in CRs. The resulting delay could disrupt the Navy’s carefully-timed and tightly scheduled roadmap for mid-life maintenance on the remaining Nimitz-class carriers until Congress provides new funding next March or specifically authorizes the Navy to move forward with the process. Construction of the first Gerald Ford-class carrier could also be delayed because of procurement prohibitions contained in the bill, though the Administration as well as legislators were already looking to add a full year to that ship’s construction schedule. The proposed CR would also prohibits the Navy and Marine Corps from entering into new multiyear procurement contracts for ships and aircraft that would likely save millions of dollars over their term. Specifically, the language could keep the Navy from extending an existing multiyear contract for F/A-18 Super Hornet tactical fighter jets and the electronic warfare version of those same jets, dubbed EA-18 Growlers. The CR would also hold up a new deal for the tiltrotor V-22 Osprey, a program the Navy and Marine Corps share with the Air Force and Special Operations Command. The same language that could hurt tactical aviation and vertical lift programs would also impact the Navy’s shipbuilding strategy. Without the authority to enter into new contracts and start advance procurement efforts, the Virginia-class fast attack submarine program could essentially grind to a halt. Buys of new Arleigh Burke-class destroyers would also be in jeopardy. To keep projects like the RCOH for CVN-71 on track, the Navy could move to reprogram funds from other accounts like the Arleigh Burke and Virginia programs, an option they admit would be unpopular among lawmakers. If Congress were to permit the shifting of dollars, the RCOH could move ahead but the other programs would incur their own delays and trigger a cost increase. If the Hill denied the request, across-the-board delays would have a similar effect on costs and would hurt long-term fleet readiness. Neither scenario solves the problem of multi-year buys for surface ships, sub’s or aircraft, and at the end of the day, the fate of these programs could have nothing at all to do with the CR. Congressional authorizers could have the final say on how DoD is permitted to use the funding included in the CR and in whatever vehicle lawmakers use to provide the balance of next year’s funding by passing the annual National Defense Authorization Act (NDAA). While the CR tells the services how much they can spend, the NDAA essentially dictates how they may spend it. Both chambers have offered their versions of the NDAA. The House completed its consideration of the bill in June, while the Senate has marked one up in Committee but not yet considered it on the floor. Both measures currently contain multiyear procurement language for new submarines, destroyers and tiltrotors, a favorable sign they will survive negotiations between the two houses. Both the House and Senate versions also authorize funding to complete the RCOH for the Theodore Roosevelt and begin buying long-lead items for the Abraham Lincoln RCOH. The House bill also contains language permitting the Secretary of the Navy to add a sixth year to the current multiyear buy of F/A-18s and EA-18s, the third such tranche. Both sides of the Hill though admit that work on the NDAA is on hold until after Election Day, increasing the likelihood of programmatic delays. Even still, with a CR in place and the NDAA in force, there also looms the prospect of nearly $500 billion in sequestration-related cuts to DoD over the next ten years. If lawmakers can’t neuter the sequestration’s trigger mechanism, the Office of Management and Budget (OMB) says defense spending will be slashed by $54.5 billion when the cuts kick-in at the beginning of January. A 400-page analysis OMB sent to Capitol Hill on Friday says the impact to Navy and Marine Corps shipbuilding and ship conversion accounts will total $2.14 billion, though the report does not detail which programs would be hit hardest. Aircraft procurement accounts will take a $2.24 billion hit, the report says. With a restrictive CR, an unfinished authorization bill and an uncertain budgetary future awaiting action by a fiercely divided and increasingly partisan Congress, the future of Navy and Marine Corps’ expeditionary influence remains very much in doubt, even as the military’s shift to the Pacific remains the centerpiece of America’s national security strategy. As Congress looks to adjourn this week until after November’s elections, lawmakers will have much work to do and not much time in which to do it when they return to Washington for this year’s lame duck session. And in January, a new Congress will need to begin work to replace the Continuing Resolution with a spending bill that covers the rest of Fiscal Year 2013.